Venus on Jan. 3rd, seen through an 8-inch telescope: video. Venus has phases, and at the moment it is a crescent. That explains the shape. But what about the colors? Atmospheric optics expert Les Cowley has the answer: "Our atmosphere is curved around the Earth and acts as a huge lens," he explains. 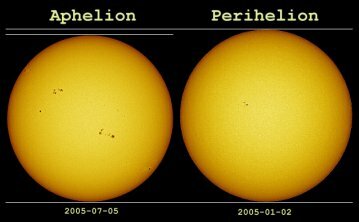 "It bends the rays from objects close to the horizon so that they appear higher in the sky than they actually are. Blue and green light are bent more than red light. 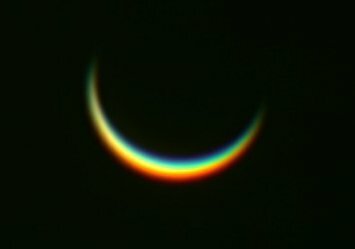 The result: the blue/green image of Venus rides highest in the sky while the red image hangs lowest, producing an upper blue/green rim and a lower red rim. Our giant lens is also unsteady and sometimes we see Venus rippling and flashing all the colors of the rainbow." You are visitor number 33674505 since January 2000.